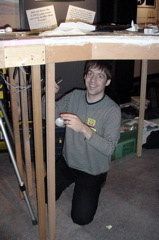 Photos and info on the first show and construction techniques. 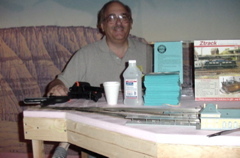 Our first show was the Pacific Science Center NMRA Divison 4 show over Thanksgiving weekend in 2002. We had three modules that had never been together before. Somehow we got it all running. 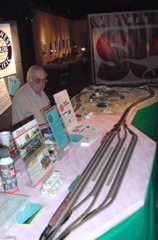 Tom Gilchrist had a 6' module that would become the "King Street Station" module. 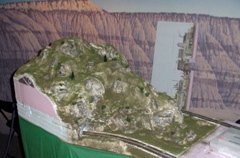 For this show Tom's module had the station, a few station tracks on an undecorated pink foam top. Andy Hunting built the base of the two loop modules (We call them end-caps) laid the cork and track, and Tom Gilchrist did the scenery. The mountain was delivered, ready to add paint, grass, and trees. During the 3 day Thanksgiving show, we painted the rocks, added the grass and started to work on the details like bushes and trees. This started how we did many of our modules. 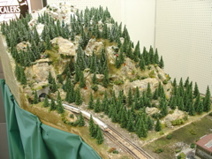 We would bring them to a show in white Hydrocal and add the scenery during the show. This is how the end-cap looks today with snow on top, signals, and lots and lots of trees. 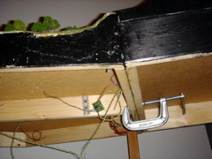 The modules use 2x2" railing material which slips into the module. There are levelers on the legs to help get things level. The early modules used 1" foam on top of 1/4" plywood. 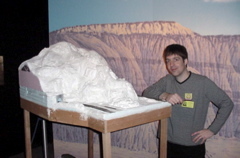 The later ones used 2" foam. 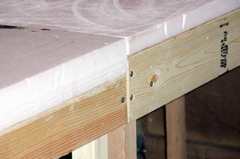 You can see how the base was changed to allow the same base height to allow for clamping. We ended up adding satin black paint to highlight contours. We then staple green plastic table cloth over the black base to hide the underneath. One or two clamps keep the modules together at the right angle and height..